Looks like the days of manual target scoring are numbered — at least for airgun shooters. Effective April 23, 2012 (after this year’s Sectionals) the NRA will accept targets digitally scanned and scored with the new Orion Scoring System. Produced by Shooter’s Technology in Virginia, the Orion System exceeds the accuracy standards set by the ISSF, and routinely scores shots within .04mm. Currently the Orion scoring system can work with 5m BB gun targets, 10m Air Rifle Targets, 10m Air Pistol Targets, and 50-foot smallbore (.22LR Rimfire) targets. Orion is working hard on more powerful software that will be able to score 50m smallbore targets — but that’s still many months away. The makers of the Orion Scoring System claim it can score targets faster, more accurately, and more reliably than scoring by hand using calipers and target plugs. Orion 2.0 will score a 12-bull air rifle target in about 5 seconds — that’s up to five times faster than manual methods. Single-shot accuracy is consistently between .04mm and .10mm, even for low velocity sporter air rifles. Multiple-shot accuracy (when two or more shots overlap on a target) is between .10mm and .25mm. The Orion Scoring System is a new technology that automates the scoring process. Shooters fire at specially-designed paper targets sourced from Orion. Once each stage of the match is completed, targets are collected and then digitized using commercial scanners. The Orion software reads the target image files, and scores each shot using an image processing algorithm. Orion’s Dr. Erik Anderson explains how the system works: “Orion’s scoring process uses a computer vision algorithm known formally as ‘Visual Image Scoring’ (VIS). VIS works in a three-step process. First, VIS calculates the precise center of the aiming bull by extrapolating and using the edge of the aiming bull. Second, VIS locates the center of each shot using a similar process using data from the shot hole edge. Finally, the distance between these two locations, called the radial distance, is used to determine the score value. A key to Orion’s accuracy is using the complete shot hole edge. In comparison, manual methods of scoring only look at the inner most edge point and thus have a limited amount of data to determine the shot value.” Anderson says the Orion Scoring System can be as accurate as very expensive electronic targets, though the Orion requires a much smaller investment in hardware. The only special equipment a shooting club needs is a decent flatbed scanner for the targets. Orion says: “most flat-bed scanners manufactured in the last five years are likely to work with Orion.” Another advantage of the Orion System over electronic targets is that a physical copy of the target exists. The match results won’t disappear if someone fries a computer hard-drive. The Orion Scoring System can generate ranked results and instantly post them online. Once a shooting facility links up to Orion’s Online Results Center, match results (and target scores) can be uploaded for later viewing on the web. If the range lacks a web connection, the Orion score data can be captured on a thumb drive and moved to a computer hooked up to the web. Orion is available from three sources: Shooter’s Technology, the makers of the Orion Scoring System, Gold Medal Shooting, and 10.9.com. Orion is licensed on an annual basis. The first year license fee is $398. The fee for the second year (and each subsequent year) is $78. Separate licenses are required for air rifle, air pistol and 50-foot pistol. Both the National Three Position Air Rifle Council and USA Shooting have approved Orion-based scoring for airgun matches. Story based on report by Kyle Jillson in The NRA Blog. Share the post "New Orion Scanning System Approved for NRA Airgun Comps"
From March 15-19, the NRA Intercollegiate Pistol Championships were held at Ft. Benning, Georgia. The tournament determined the National Collegiate Individual and Team Champions in NTA Intercollegiate Free Pistol, Standard Pistol, Open Air Pistol, Women’s Air Pistol and Women’s Sport Pistol. Both men and women competed shoulder to shoulder in Free Pistol, Standard Pistol, and Open Air Pistol events, but there were separate Ladies’ Only matches for Air Pistol and Sport Pistol. Men and Women shooters competed in separate divisions. There was a strong rivalry among the military academy teams in the Women’s Pistol Matches at the USAMU’s 25 meter range. In Women’s Sport Pistol, the U.S. Naval Academy earned its second Women’s championship this year with a score of 1626, topping the West Pointers by 24 point. In the individual Sport Pistol finals, Kirsten Asdal of the U.S. States Naval Academy took the win with a 655.3 score, edging West Point’s Heather Deppe (653.9 score). The Lady Midshipmen (Midshipwomen?) also won the Women’s Air Pistol Championship with a final team score of 1086. Arch-rival West Point finished second with a 1073 team Air Pistol score. USNA, USMA, Ohio St., Citadel, Oregon St., USCGA, MIT, Texas A&M, Yale and USMMA were all represented in the team championship by shilled shooter however after the third stage had been fired the United States Military Academy had emerged victorious with a total team score of 2121. Tallying up another championship under his belt this year, Nick Mowrer of Pikes Peak Community College shot a 569 to claim the Standard Pistol Individual title. Below, courtesy The NRA Blog, is a slide show from the NRA Intercolllegiate Pistol Championships. 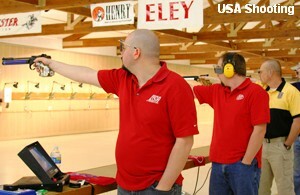 Share the post "NRA Intercollegiate Pistol Championship Concludes"
Thanksgiving is almost here. At this time of year many Eastern and snow-belt shooting ranges halt operations for the winter. If you’re an avid rifleman who enjoys shooting regularly, the dark days of winter can bring withdrawal pains. The closure of outdoor ranges can mean months of forced inactivity… unless you have an all-weather indoor shooting solution. 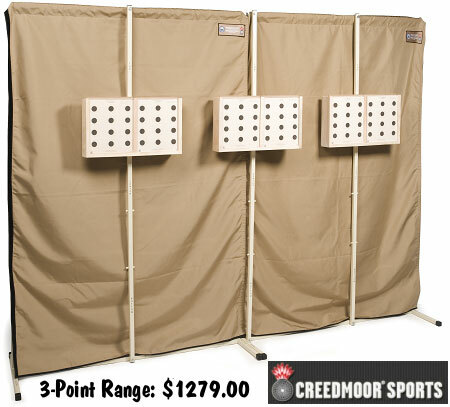 Creedmoor’s patented 10m Air Gun Range provides a target holder and a curtain-type backstop capable of stopping pellets with a muzzle velocity up to 600 fps. The target support poles allow three (3) double target boxes to be positioned with attachment points at the correct heights for prone, kneeling, and standing. Creedmoor says the target boxes provide 100% containment for any pellet passing through the target — so you won’t have pellets scattered all over the floor. 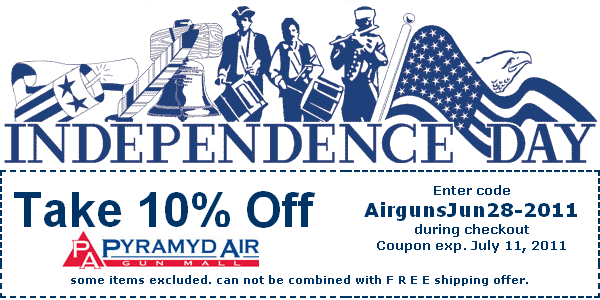 The 10M Air Gun Range is available either in a 3-station configuration for $1279 (item 3AGR), or as a one-station (single-point) range for $295 (item AGR-SINGLE). 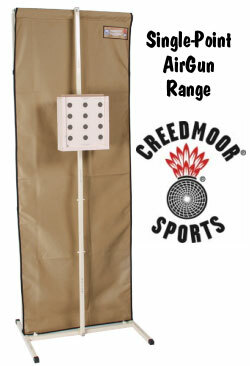 Creedmoor’s Air Gun Range is a proven, heavy duty product — the only Air Rifle target system ever tested and approved by the U.S. Military. This system is currently being used in more than 600 schools nationwide, as well as the new CMP shooting facility in Alabama. The 3-station range easily dis-assembles for transport and storage, fitting inside a 34″ x 10″ x 8″ carry duffle Creedmoor provides. Share the post "Shoot and Train Indoors with Portable 10M Air Gun Range"
The Modern Pentathlon is a 5-discipline Olympic event that combines Horse Riding, Running, Swimming, Fencing, and Shooting. Whether there will really be any “shooting” anymore is questionable if Pentathlon officials succeed in their plan to replace air pistols with laser devices. 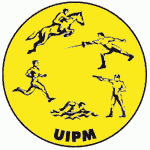 That’s right, the Snowflakes in Hell Blog reports that the UIPM, the international governing body for Modern Pentathlon, intends to replace air pistols with laser “pistols”, ostensibly to reduce the environmental impact of lead pellets. We think this is just a “feel-good” move reflecting anti-gun political agendas. Pentathlon air pistols fire tiny 7-grain pellets that are easily captured by bullet traps, so there is virtually no environmental risk. 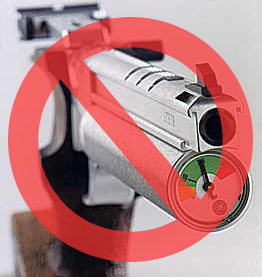 Share the post "No More Air Pistols for Modern Pentathlon — Politically Correct Lasers Instead"